The Japanese have always cared greatly about their appearance and especially about the style and arrangement of their hair. Westerners traveling through Japan in the late 19th century often commented after this fact, noting that even very poor Japanese always took care to maintain their hair though their clothes may be but rags. The woman in this photo reminds us of this fact of Japanese culture as her clothing and Nihongami-style coiffeur can only be described as perfect. 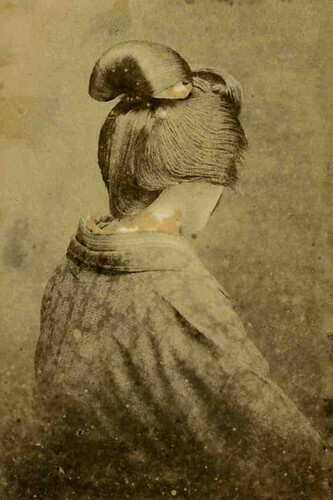 A splendid and very Japanese photograph worthy of being noted as emblematic of feminine virtue in old Japan. This original old photograph is mounted and in poor condition with scratches, stains, fading and discoloration. The photographer’s name ‘G Nishimura‘ is printed on the mounting. The photo dates from the early to mid 20th century and was acquired in the historic city of Shizuoka, Japan near the foot of Mt. Fuji.